The New Bridge Community Centre is an exciting concept – a Centre wholly commissioned, funded and run by and for the community in a space leased to them within a functioning parish church. The idea for the Centre grew out of the Parish Plan consultation for our group of parishes comprising Bishopstone, Bridge Sollars, Byford, Kenchester and Mansell Gamage. This showed a very real need for a community meeting place within the parishes and St Andrew’s church was chosen as the most suitable central site. Volunteers from the 5 parishes formed a steering group, together with a representative from the PCC, and the project was launched. 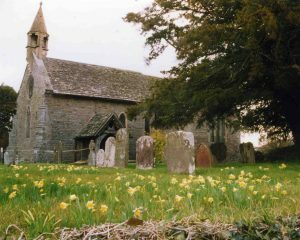 As with all ground-breaking projects things did not always run smoothly but we made a successful application to the Big Lottery Community Buildings Fund and, with the support of the diocese of Hereford, the PCC agreed to grant us a licence to occupy the nave and north aisle of the church. Our architects, Communion Design, produced an imaginative plan for the conversion. The cube containing the kitchen, toilet and services can be enclosed from view when the whole church is used for a service, while drawing the heavy curtains across the chancel arch makes the instant change to full community use. A grant from Awards for All helped us to fit out the Centre with chairs, tables and other equipment and after sterling work by our contractors and volunteers the Centre opened to the community in July 2011. The New Bridge Community Centre is the result of a community-based project to convert the nave of St Andrew’s Church. 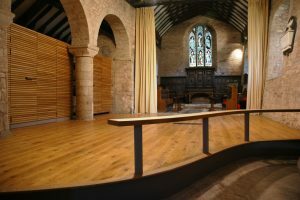 The church is a Grade 1 listed building dating from the 12th century and the conversion has used local materials and modern, environmentally friendly technology to complement the ancient building and to create something really special. As you enter the building you will see evidence of its Norman origins in the carvings on each side of the south porch doorway, depicting a dragon on one side and on the other a demon’s head with more dragons issuing from its mouth to whisper in its ears. These are a fine example of the Herefordshire School of carving. Our conversion has preserved and enhanced the historic features of the church, such as the Norman font, and the lovely roof of the north aisle, which dates from about 1330. Like those early builders we have used local materials, such as Herefordshire oak for our service cube, but we have added comforts that they never knew like the under-floor heating, low-energy lighting, and modern seating. We have preserved the memory of the people who used the building in the past, keeping their monuments on the walls and under glass panels in the floor. At the same time we have brought their building into the 21st century and opened it up for use and enjoyment by a new generation of the local community.